Nicolas Cressey and Bill Taylor. To this end the Secretary in conjunction with the Executive Committee organises at least one literary event annually to bring members together for a talk on some aspect of E. F. Benson’s life and work. We have an annual meeting in Rye ( E F Benson’s Tilling ) each July and we also aim to organise outings to other places of Benson interest and from time to time events which relate to other members of the Benson Family. The Secretary gives Talks about the life and works of Fred Benson and also about his time in Rye. The Society was formed in 1984 and events have included visits to Wellington College, Marlborough College, Cambridge University, Winchester, Tremans ( 2001 ). The Society has also mounted exhibitions on the life and works of E. F. Benson. In 1990, to commemorate the 50th anniversary of E. F. Benson’s death, the Society held a reception at Lambeth Palace followed by a Memorial service at the Church of St Mary the Virgin at Rye. The Society also produces its own Journal “The Dodo” each year as well as a variety of other publications. 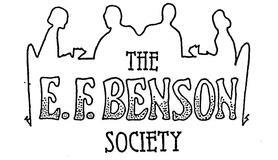 The E. F. Benson Society is affiliated to the Alliance of Literary Societies. The Society’s logo was designed by Nick Tudor.